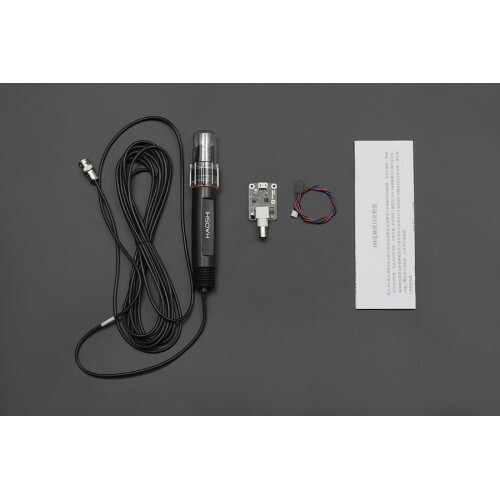 This is an Analog pH Meter Kit with industrial real-time online electrode, specially designed for Arduino controllers. It use an industry electrode and has built-in simple, convenient ,practical connection and long life (up to 1 year), which makes it very suitable for long term online monitoring. It has an LED which works as the Power Indicator, a BNC connector and PH2.0 sensor interface. To use it, just connect the pH sensor with BND connector, then plug the PH2.0 interface into the analog input port of any Arduino controller. If programmed, you will get the pH value easily. This industrial pH electrode is made of sensitive glass membrane with low impedance. It can be used in a variety of PH measurements with fast response and excellent thermal stability. It has good reproducibility, is difficult to hydrolysis, and can eliminate basic alkali error. In 0pH to 14pH range, the output voltage is linear. The reference system which consist of the Ag /AgCl gel electrolyte salt bridge has a stable half-cell potential and excellent anti-pollution performance. The ring PTFE membrane is not easy to be clogged, so the electrode is suitable for long-term online detection.